You may recall that I posted some months ago about the vintage quilt pieces I bought in an online auction. I have been meaning to make them up into a quilt top, but it has taken a while to decide what quilt design they were intended to become. 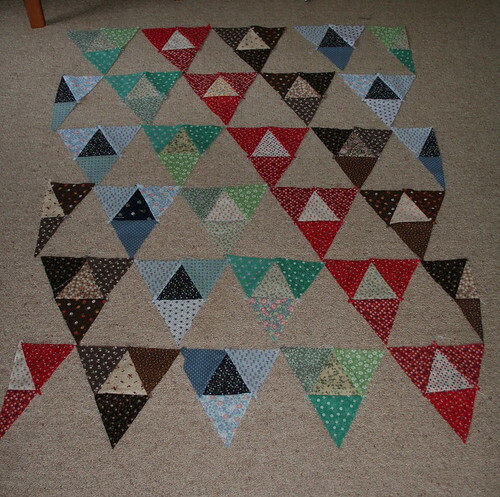 I've had some advice from the ladies in the Flickr quilting group and finally decided to sort the triangles into colours and then sew them into larger blocks. I'll alternate these coloured blocks with plain white triangles. It will be a variation of the 1000 pyramids pattern I think. Here's a picture of where I am up to so far. I'm hoping to get the quilt top finished this weekend so I can move on to quilting it. I'm pleased with how it is coming together. I will have quite a lot of vintage triangles left over, mostly in neutral floral prints (browns and creams). Not too sure what to use them for yet. If anyone has any bright ideas, let me know. They may end up back at the op-shop. Lovely! Can't wait to see the finished product! What a stunning quilt top! I'm still working on one made from thrifted fabircs too! 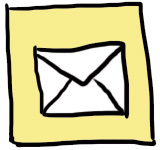 Hi there, just found your FAB blog and have now missed the whole of ER while reading it!!!!! Wow you have made some great stuff, I love that you do a bit of everything. About 7 years ago my mother in law made a delicious chocolate slice. I have asked her OFTEN for the recipe, but she has not been able to find it....Low and behold the exact recipe is here on your blog! Definately worth missing ER for.. I am relatively new to blogland and have recently started my own blog as a result of all the inspiring blogs that I have read. I am totally hooked. Hrmmmm... what to do... what to do. I have nothing. Very pretty :) Love the colours, can't wait to see some more progess pics on it.